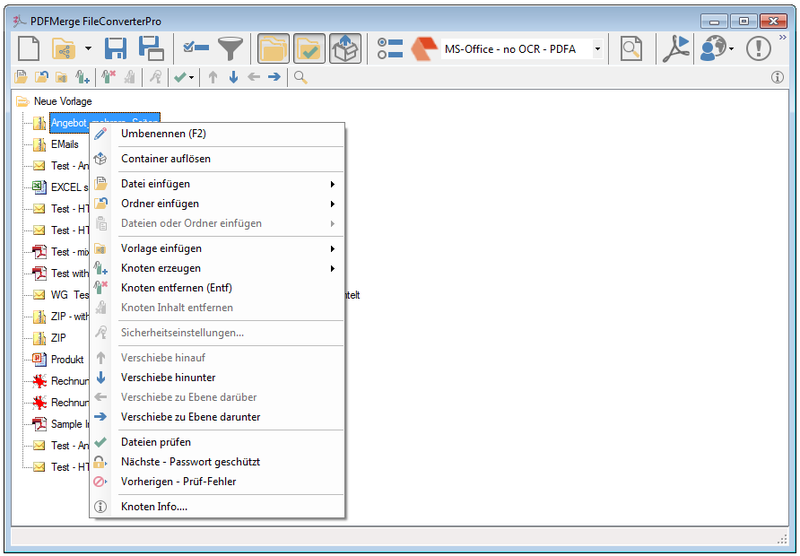 Based on PDFMerge we brought out a PDFMerge Client for the FileConverterPro (FCpro) Server. It makes it possible to produce document conversions and compilations as PDF or PDF/A from any workplace. The PDF-conversion and processing of the documents is done via a FileConverterPro Server-service reachable in the local network or via the internet, which is addressed with SOAP / REST through HTTP(S). With that resources can be used collectively more efficient: the local computers get relieved, applications installed centrally (MS-Office, DWG/DXF converter or an Abbyy OCR Engine) get installed centrally and used together and don’t have to be installed on the local workplaces. The PDF or PDF/A conversion doesn’t take place locally but via HTTP(S) communication through a central FCpro service. 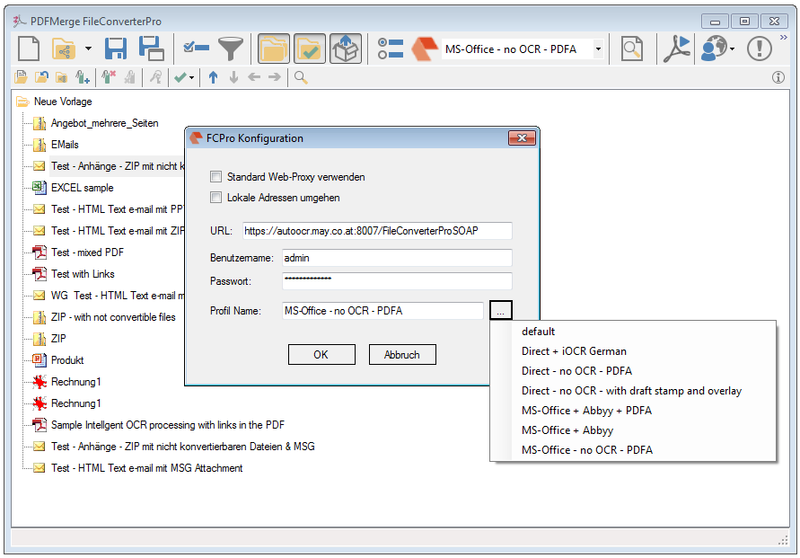 No local installation of MS-Office, DWG/DXF converter and Abbyy OCR Engine needed – because the central FCpro service is used. No configuration of own local conversion profiles needed – selection of centrally predefined FCpro profiles. Document preview only possible for image and PDF documents. More compact setup – 65MB to 240-500MB – because the PDF converter and the OCR engine aren’t installed locally. Simplified usage because less configuration possibilities are available. 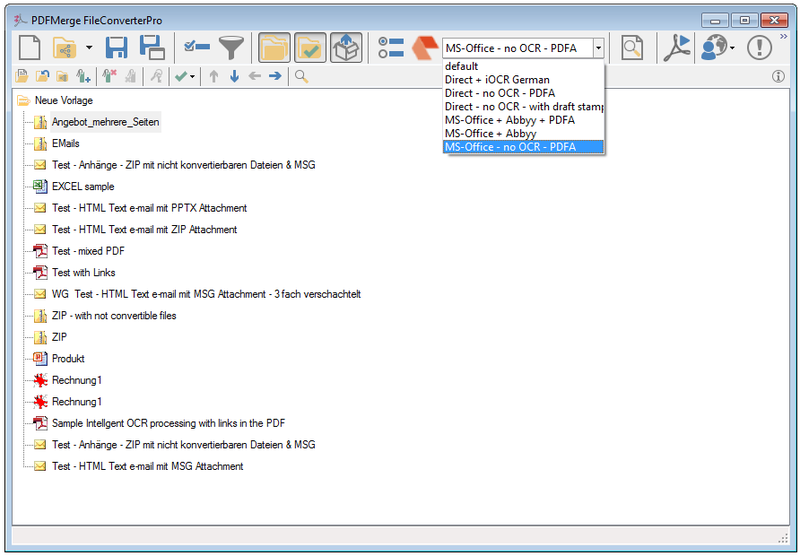 Cost-effective option to produce PMT / PMTX files on any workplace to process them via a FCpro Server or PDFMerge. Setting of the PDF info fields, PDF-open parameters and PDF rights and opening password. Pagination and text stamp with a multiplicity of variables and configuration options. TOC – table of contents generated from the bookmarks automatically (planned). After the installation of the PDFMerge Client for the FileConverterPro (FCpro) Server the processing can be tested immediatly with our FCpro testserver which is freely reachable via the internet, because the connection data needed is already predefined in our setup. The commandline parameters of PDFMerge are also valid, whereby the profiles refer to the FileConverterPro profiles of the configured FCpro server.